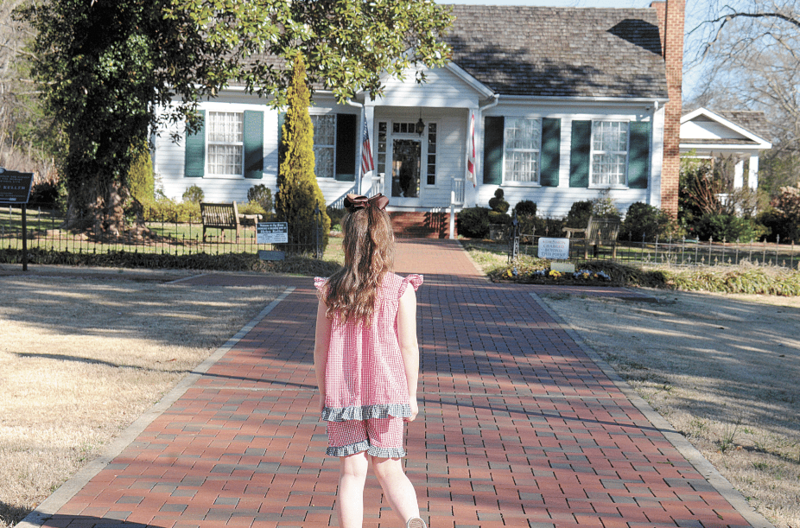 Chaney Rohling, a student at Vestavia Hills Elementary-East, approaches Helen Keller’s home, Ivy Green, in Tuscumbia. Photo by Lynn Grisard Fullman. If for a minute you feel a twinge of envy that your friends are packing to go to faraway places during spring break, don’t despair. There are plenty of interesting places closer to home to keep you and your family entertained. “There is a joke among tourism professionals called ‘the inverse law,’ which means the closer you are to an attraction, the less likely you are to visit,” Alabama Tourism Director Lee Sentell said. Spring also is the best time to spend a Saturday morning at the Pepper Place market in Birmingham, he said. There you’ll find fresh local produce along with locally made products and arts and crafts for sale. And he said he’s looking forward to trying out the new Pizitz Food Hall in downtown Birmingham, which has stalls with food from across the country and the world. If you have kids to entertain over their school break, try the McWane Science Center in downtown Birmingham or drive to Huntsville to the U.S. Space & Rocker Center. Sentell also mentioned the expanded National Park Service Visitor Center a block from the Edmund Pettus Bridge in Selma, where civil rights marchers were beaten by police in what later became known as Bloody Sunday. There’s lots more to do across the state no matter what you’re in the mood for. So take a look at your options, gas up, head out – and be sure to take plenty of photos. • Each generation revels in discovering Ivy Green, birthplace and home of Helen Keller, who at a young age was rendered blind and deaf yet went on to become a legendary symbol of overcoming hardship. Built in Tuscumbia in 1820 by Helen’s grandfather, the home each summer hosts an outdoor drama focused on how she overcame obstacles. The water pump where learning began for the once-unruly child is a sobering part of the tour. • Spring Family Days are planned for March 27-31 at the 135-acre Landmark Park on the outskirts of Dothan, which preserves the area’s agricultural history. Among the places to tour are a planetarium, 1890s farmstead, wildlife exhibits, interpretive center, nature trails and picnic area. Osmonds, Etta James and Paul Anka, the Shoals area in north Alabama was nicknamed the “Hit Recording Capital of the World.” Following years of closure, for the first time since 1978 the Muscle Shoals Sound Studio offers both tours and recording sessions. The studio draws artists from across the world who are looking for the famed “Muscle Shoals sound.” Visitors may step into an isolation booth and belt out a few notes of their own. • Moundville Archaeological Park, not far from Tuscaloosa, showcases what once was the Southeast’s largest and most powerful Native American political and religious center. Exhibits, dioramas and video bring to life the early dwellers’ history and mystery. • Florence now has its own Native American museum. At the $1.76 million Florence Indian Mound Museum, half of the structure resembles a cave being excavated by archaeologists. The museum faces a 2,000-year-old mound once used for ceremonies. • Shaped like a vessel headed to sea, the newly re-opened GulfQuest National Maritime Museum is the centerpiece of Mobile Landing, the city’s new downtown waterfront development. Housing the museum’s exhibits, a replica of a full-sized container ship – with containers stacked high and the vibration of engines – focuses on the development of containerization, a revolutionary idea pioneered in the 1950s by Malcom McLean, owner of Waterman Steamship Corporation in Mobile. • Opened last summer, Gulf Coast Ducks provides boat tours of the Mobile River, downtown Mobile, Mobile Bay and Battleship Park. • Five Rivers Delta Center rents kayaks and canoes and offers a pontoon delta safari, with Wild Native Delta Safaris, that focuses on marsh, cypress and tupelo gum swamps, alligators and wildlife. • Gulf Coast Exploreum Science Center and IMAX Theater in Mobile has about 150 hands-on science adventures, including the nation’s most advanced health exhibit. • USS Alabama Battleship Memorial Park holds dramatic exhibits telling stories of heroism and courage in the Armed Forces. Better yet, you can roam throughout a real battleship that sits along Mobile Bay. • Recently ranked by trivago as one of the Best Value Cities significant to African- American history, Montgomery is home to the Rosa Parks Library and Museum. Also here is the world’s only museum dedicated to F. Scott and Zelda Fitzgerald. Housed on the first floor of a two-story clapboard and brick house where the flamboyant couple lived from 1931 to 1932, the home is where he worked on “Tender is the Night” and she began her only novel. For more information on things to see and do in Alabama, contact the Alabama Tourism Department: tourism.alabama.gov, 800-ALABAMA (800-252-2262) or info@tourism.alabama.gov. An award-winning writer based in Vestavia Hills, Lynn Grisard Fullman has contributed to numerous newspapers, magazines and blogs. She is the author of six books, including several on travel in Alabama.